WELLSBURG — The 35th-annual Steubenville Early Bird Invitational had a new, temporary home this year with the cooperation of two coaches, allowing the event to happen. With the track at Harding Stadium, the event’s usual home, being repaired, Brooke High School hosted Saturday’s meet at Brooke Memorial Stadium after Bruins coach Paul Julio and Big Red coach Jason Kernahan came together to make sure the event went on. For Julio, it was a no-brainer. After all the events were completed, the big winner was Oak Glen, sweeping both the boys and girls team titles. The boys put up a score of 116, with five individual event winners. Jacob Clark won the 110-meter hurdles, Seth Mozingo the 300 hurdles, the 3200 relay team (Matthew Wright, Mason Konchar, Konnor Allison and Nathan Atkinson) took the top spot, while Gage Patterson (long jump) and Kellen Tropeck (shot put, discus) nearly gave the Golden Bears a sweep of the field events. “I’m very, very happy,” Oak Glen boys coach Rance Everly said. “We had a lot of returners coming back, and our goal was to walk away with the trophy. It’s a good sign for things to come. The girls finished with a score of 100, led by another five event winners. Izzy Barganski swept the hurdles events, the 800 (Barganski, Gracie Wright, Abigail Myers, Maggie Kovalcik) and 1600 (Wright, Arner, Kovalcik, Myers) teams both won, while Kovalcik won the long jump. Big Red placed third in both portions. For the boys, Caleb Mitchell won the 100 dash and anchored the 400 relay team to victory, along with Jaziah Blackwell, Anthony Rice and Tayveon Montgomery. For the girls, T’Kayla Kelley won the 100 and 200 dashes. Catholic Central also had a solid day, placing second in the girls portion and fith in the boys. The girls got individual wins from Rebecca Bodo in the 400 dash and the 400 relay combination of Rebecca Bolster, Elizabeth Bolster, Emma Borden and Emily Vitlip. On the boys side, Joe Rohde won the 800 and Patrick Kuebler the 3200. Indian Creek was top five in both portions, as the girls placed fourth and boys fifth. The 3200 relay team of Rileigh Gualtiere, Payton Freshwater, Abby Copeland and Sloane Lewis gave the girls an event win, while the boys got one from Logan Davis in the 400 dash. The Brooke girls placed a solid fifth on their home track, while the boys were 13th. Emily Donley was the top girl performer for the Bruins with a second place in the 3200 run. Madonna finished seventh in the boys portion and eighth in the girls. The Blue Don boys got a win from Angelo Quattrochi in the 1600 run, while the girls’ top placer was Kennedy Martin, who was second in the discus throw. The Edison Wildcats ended up just inside the top 10 in both the boys and girls portions. The girls were ninth with a strong showing in the field events from Faith Hoobler, who threw both the discus and shot put, while the boys got second place showing from Kaleb Waggoner in the high jump. Bryce McAfoose was third in the 300 hurdles and fourth in the 110 hurdles. A young Weir High team, without a couple of its top members, placed eigth in the boys portions and 10th in the girls. The top finish on the girls side was from the 400 relay team of Taryn Davis, Sarah Hudacheck, Nevaeh Colliers and Blaire McUmar, which placed second. The boys got fourth-place showings from Quincey Damerson in the 100, James Littleton in the 300 hurdles, Reed Reitter in the long jump and a pair of relay teams (800 and 3200). Buckeye Local was ninth on the boys side, with Jacob Pielech finishing second in the 200 and third in the 400. The girls ended the day 12th. Toronto finished the day 11th in the girls portion and 12th on the boys side. Isabella Irwin won the girls high jump for the Red Knights. For Martins Ferry, which was seventh on the girls side and 11th on the boys side, Natalie Forsyth swepth the long distance runs, winning the 1600 and 3200 for the Purple Riders. Wheeling Central was sixth on the girls side, led by Nicole Billie’s win in the 800 and 14th on the boys side. East Liverpool ended the day sixth on the boys side (it did not field a girls team in the event), led by Brennan Smith (fourth in the 800) and Izaiha Browning (fourth in the 3200). GIRLS: 1. Oak Glen 100; 2. Catholic Central 84; 3. Steubenville 62; 4. Indian Creek 56; 5. Brooke 42; 6. Wheeling Central 40; 7. Martins Ferry 30; 8. Madonna 27; 9. Edison 23; 10. Weir 18; 11. Toronto 10; 12. Buckeye Local 1. BOYS: 1. Oak Glen 116; 2. Glenville 98; 3. Steubenville 48; 4. Catholic Central 44; 5. Indian Creek 32; 6. East Liverpool 28; 7. Madonna 27; 8. Weir 24.5; 9. Buckeye Local 24; 10. Edison 17; 11. Martins Ferry 15; 12. Toronto 13; 13. Brooke 7; Wheeling Central 2.5. 100 DASH: 1. T’Kayla Kelley (Steubenville) 13.07; 2. Karlie Vandeborne (Catholic Central) 13.46; 3. Kenadee Wayt (Wheeling Central) 13.68; 4. Maggie Kovalcik (Oak Glen) 13.97. 200 DASH: 1. T’Kayla Kelley (Steubenville) 22.27; 2. Karlie Vandeborne (Catholic Central) 27.60; 3. Kenadee Wayt (Wheeling Central) 28.07; 4. Carly Dowiak (Madonna) 28.72. 400 DASH: 1. Rebecca Bodo (Catholic Central) 1:02.76; 2. Rebecca Bolster (Catholic Central) 1:04.45; 3. Allyson Tweedy (Indian Creek) 1:04.70; 4. Abigail Myers (Oak Glen) 1:05.51. 800 RUN: 1. Nicole Billie (Wheeling Central) 2:31.72; 2. Sloane Lewis (Indian Creek) 2:48.62; 3. Hannah Hupp (Martins Ferry) 2:49.23; 4. Sophia Arner (Oak Glen) 2:50.38. 1600 RUN: 1. Natalie Forsyth (Martins Ferry) 5:55.73; 2. Anastasia Crisante (Steubenville) 5:57.54; 3. Sloane Lewis (Indian Creek) 6:11.10; 4. Hannah Hupp (Martins Ferry) 6:14.65. 3200 RUN: 1. Natalie Forsyth (Martins Ferry) 12:46.52; 2. Emily Donley (Brooke) 14:31.64; 3. Lindsey Decker (Catholic Central) 15:38.69; 4. Miryan Gonzalez (Catholic Central) 15:38.97. 100 HURDLES: 1. Izzy Barganski (Oak Glen) 17.73; 2. Abby Copeland (Indian Creek) 18.45; 3. Gracie Wright (Oak Glen) 18.83; 4. Clara Symington (Catholic Central) 18.92. 300 HURDLES: 1. Izzy Barganski (Oak Glen) 52.11; 2. Gracie Wright (Oak Glen) 52.36; 3. Clara Symington (Catholic Central) 52.79; 4. Abby Copelan (Indian Creek) 52.90. 4X100 RELAY: 1. Catholic Central (Rebecca Bolster, Elizabeth Bolster, Emma Borden, Emily Vitlip) 55.59; 2. Weir 55.63; 3. Brooke 55.92; 4. Oak Glen 56.46. 4X200 RELAY: 1. Oak Glen (Izzy Barganski, Gracie Wright, Abigail Myers, Maggie Kovalcik) 1:53.44; 2. Wheeling Central 1:53.97; 3. Steubenville 1:54.92; 4. Weir 1:57.21. 4X400 RELAY: 1. Oak Glen (Gracie Wright, Sophia Arner, Maggie Kovalcik, Abigail Myers); 2. Catholic Central 4:30.07; 3. Wheeling Central 4:39.46; 4. Steubenville 4:47.32. 4X800 RELAY: 1. Indian Creek (Rileigh Gualtiere, Payton Freshwater, Abby Copeland, Sloane Lewis) 11:11.27; 2. Madonna 11:31.36; 3. Steubenville 11:51.55; 4. Oak Glen 12:28.48. HIGH JUMP: 1. Isabella Irwin (Toronto) 4-08; 2. Mara Pendergast (Brooke) 4-06; 2. Rileigh Gualtiere (Indian Creek) 4-06; 4. Rachel Clayton (Brooke) J4-06. LONG JUMP: 1. Maggie Kovalcik (Oak Glen) 16-02; 2. Emily Vitlip (Catholic Central) 13-11; 3. Estella Lahita (Brooke) 13-10; 4. Marisa Horan (Wheeling Central) J13-10. SHOT PUT: 1. Faith Hoobler (Edison) 34-07; 2. Amya Livingston (Steubenville) 32-04; 3. Emily Ashcraft (Oak Glen) 30-03; 4. Mia Ridgway (Oak Glen) 28-04. DISCUS: 1. Faith Hoobler (Edison) 115-04; 2. Kennedy Martin (Madonna) 102-07; 3. Amya Livingston (Steubenville) 95-01; 4. Connor Gibson (Oak Glen) 85-07. 100 DASH: 1. Caleb Mitchell (Steubenville) 11.70; 2. Treyvon Dimmings (Glenville)11.80; 3. Ricardo Hawkins (Glenville) 11.92; 4. Quincey Dameron (Weir) 11.94. 200 DASH: 1. Desean Evans (Glenville) 23.83; 2. Jacob Pielech (Buckeye Local) 24.19; 3. Jorian Jones (Steubenville) 24.29; 4. Tristan Lawson (Oak Glen) 24.42. 400 DASH: 1. Logan Davis (Indian Creek) 52.96; 2. John Davis (Glenville) 53.24; 3. Jacob Pielech (Buckeye Local) 53.82; 4. Desean Evans (Glenville) 55.57. 800 RUN: 1. Joe Rohde (Catholic Central) 2:12.55; 2. Angelo Quattrochi (Madonna) 2:14.22; 3. Jakob McCombs (Madonna) 2:17.43; 4. Brennan Smith (East Liverpool) 2:18.77. 1600 RUN: 1. Angelo Quattrochi (Madonna) 4:50.04; 2. Patrick Kuebler (Catholic Central) 4:55.55; 3. Nathan Atkinson (Oak Glen) 5:01.12; 4. Brody Cermak (Buckeye Local) 5:01.46. 3200 RUN: 1. Patrick Kuebler (Catholic Central) 11:11.54; 2. Konnor Allison (Oak Glen) 11:17.31; 3. Brody Cermak (Buckeye Local) 11:18.43; 4. Izaiha Browning (East Liverpool) 11:23.28. 110 HURDLES: 1. Jacob Clark (Oak Glen) 16.97; 2. Anthony Rice (Steubenville) 16.99; 3. Michael Herrmann (Catholic Central) 17.40; 4. Bryce McAfoose (Edison) 18.12. 300 HURDLES: 1. Seth Mozingo (Oak Glen) 43.37; 2. Jalen Foster (Glenville) 44.56; 3. Bryce McAfoose (Edison) 44.95; 4. James Littleton (Weir) 46.73. 4X100 RELAY: 1. Steubenville (Jaziah Blackwell, Anthony Rice, Tayveon Montgomery, Caleb Mitchell) 45.55; 2. Glenville 45.79; 3. Oak Glen 46.24; 4. Indian Creek 46.46. 4X200 RELAY: 1. Glenville (Ricardo Hawkins, Desean Evans, Treyvon Dimmings, George Bullock) 1:34.17; 2. Oak Glen 1:35.72; 3. Indian Creek 1:36.22; 4. Weir 1:39.71. 4X400 RELAY: 1. Glenville (Jalen Foster, Desean Evans, John Davis, Treyvon Dimmings) 3:36.12; 2. Oak Glen 3:38.74; 3. Catholic Central 3:53.91; 4. Indian Creek 3:54.13. 4X800 RELAY: 1. Oak Glen (Matthew Wright, Mason Konchar, Konnor Allison, Nathan Atkinson); 2. East Liverpool 9:03.64; 3. Glenville 9:22.54; 4. Weir 9:45.03. HIGH JUMP: 1. Zach Stackhouse (Toronto) 5-08; 2. Kaleb Waggoner (Edison) J5-08; 3. Jakih Scales (Indian Creek) J5-08; 4. Jacob Clark (Oak Glen) 5-06. LONG JUMP: 1. Gage Patterson (Oak Glen) 19-07; 2. Jorian Jones (Steubenville) 19-01; 3. 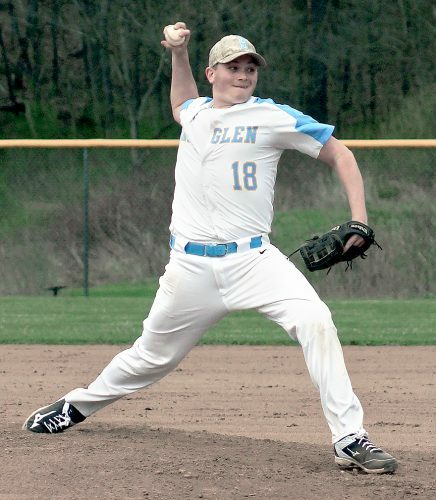 Tristan Bentley (Glenville) 18-04; 4. Reed Reitter (Weir) 18-02. SHOT PUT: 1. Kellen Tropeck (Oak Glen) 53-11; 2. Jimmy Jenkins (Glenville) 48-08; 3. Maxwell McCray (Glenville) 42-03; 4. Shane Krob (Martins Ferry) 40-07. DISCUS: 1. Kellen Tropeck (Oak Glen) 158-07; 2. Logan Meadows (Oak Glen) 128-02; 3. Brendan Adams (Martins Ferry) 127-06; 4. DeShawn Nixon (Steubenville) 117-00.